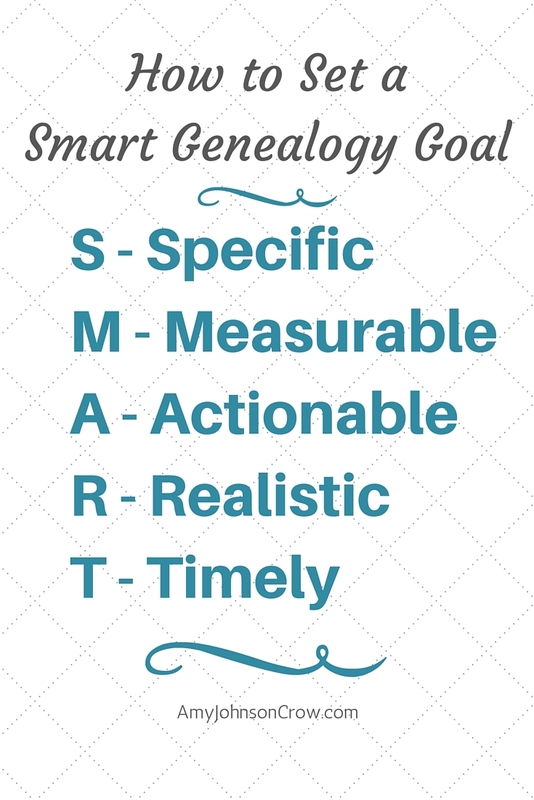 Have you ever set a goal or made a resolution about your genealogy and it just didn’t work out? If those stacks of copies are still on your dining room table and your photos are still unlabeled and unorganized, take heart. You’re not alone. The Washington Post reports that 25% of people give up on their New Years resolutions in the first week. But you can be successful with your family history goals. The key is to set the right goal… You could even say a SMART goal. When you include these elements in your goal or resolution, you have a better chance of reaching it. It’s hard to hit a mushy goal like “I’m going to research more.” When our goals are vague, so are our results. 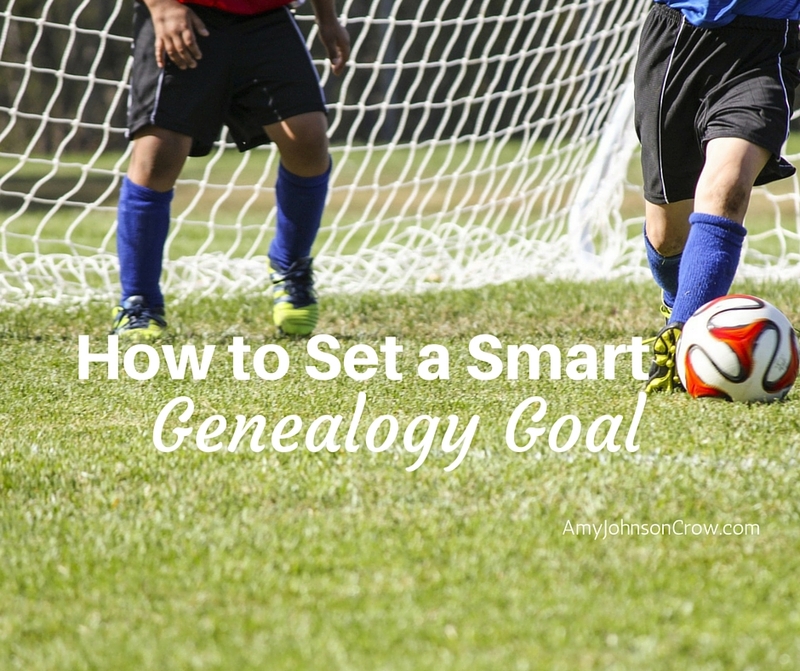 A common genealogy goal is “I’m going to get better at citing my sources.” Let’s take that and turn it into a SMART genealogy goal. “Specific” lays the foundation for the goal. What is it you’re trying to achieve? “I’m going to be better at citing my sources” isn’t specific. What does “better” mean? Sources from what? Measurable often goes along with specific. Measurable gives us a way to mark our progress and see how close we’re getting. We can cheer ourselves on when we hit a milestone and we can take action when we’re coming up a little short. “Rewrite my source citations” isn’t measurable. We can take our goal and improve it by making it more specific and measurable. Goals are pretty pointless if you can’t do anything about hitting them. They also fall short if we set ourselves up for failure. One way you can make a goal both actionable and attainable is to work in an action plan. It is possible to be both realistic and stretch your achievements. The following addition to our goal is still a stretch, but is more realistic. 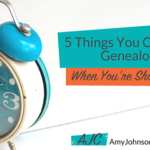 Consider what you’d like to improve upon with your genealogy. Is it improving your source citations? Is it learning how to use land and tax records? Is it compiling that family history that you’ve talked about forever? Take that fuzzy goal and turn it into a SMART goal. This is excellent advice and a terrific goal. For me, the hour between 7 and 8 pm (between the news and prime time television) could be productive for working on long-term goals. So I’ve set a daily alarm on my phone to remind myself to USE that time. I like to have some productive-yet-not-taxing-on-the-brain activities. Helps me feel like I’m getting something done in those times when I can’t really “dig into” something. Great advice! I retired in March & had all these great plans. Now I know why I’ve gotten nothing done but created more chaos. Your 30 days emails were put in my ‘someday’ folder but since reading this I’m pulling them out & be SMART about it! I really look forward to your email articles! Thank you for all the work you do! Thank you, Julie! I appreciate that. You can do it! Break it down in to smaller pieces and take it one step at a time. (Oh, and don’t overthink it. They’re really not trying to trick you!) Good luck. Great advice but what is Evidence Explained format? I told myself I would join Ancestry.com for a year, just until I got all the records I needed from them. That was in 2004 and I’m still going strong and loving every minute of it. Happy New Year and keep up the good work. “Evidence Explained” is a book by Elizabeth Shown Mills. 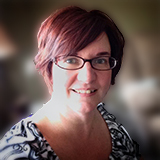 In it, she explains different types of evidence and has suggested formats for how to cite them. I think the trackable part could be improved. How many source citations are on Mom’s side of the tree? Let’s say 237. Now each month until June 1, 2016, you can track how far towards your goal you are, and learn whether you are on track, or need to focus more. I.e. 46 citations by 2/1 would be on track. More? Great; Fewer, you need to concentrate. Yes, you definitely need to track! That’s often where people miss hitting their goals (if they made them measurable at all). Cousin Amy, this is a terrifically practical post, perfect for looking forward. I have set a principal goal of obtaining copies of key documents (such as estate items) for which I have citations but only handwritten notes about content. So far this has resulted in fleshing out the citations and correcting little errors, so it’s all to the good. One thing that’s been gnawing at a little part of my brain for a long time is lack of access to Monongalia County, West Virginia, Estate Book No. 4. The times I’ve been there, the staff claim not to know where it is. It’s been tucked away somewhere a long time, since some of the indexes confuse it with material that’s actually in Book 5. Of the items in Book 4 is the estate appraisal for our mutual ancestor, Henry Amos (ca. 1750s?-1837), who first bought land in Monongalia County in 1790. 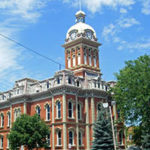 The property is in what became Marion County in 1842. Henry has been a bit mysterious to me. Few land records, a will, a very terse pre-nuptial agreement with his last wife, and some bare-bones tax assessment rolls do not flesh him out much. Happily, the GSU microfilmed Monongalia County Estate Book 4 before it made its disappearance from the County Clerk’s shelves. 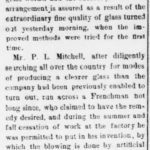 Equally happily, this microfilm has been digitized and now is hosted by Ancestry.com. Excellent advice, as usual. Thanks, Amy, for sharing your tips with us. I hope 2017 brings you lots of success with your own family history.